Father Raed Abusahlia, general director of Caritas Jerusalem, said July 18 that more than 80,000 Palestinians had been displaced and 1,250 homes have been completely demolished in Israeli airstrikes and the invasion of Gaza in July. He said 80 percent of the Gaza Strip was without electricity and 90 percent of people did not have drinkable water. The priest said Gazans need hospital supplies. He said Caritas medical staff had been volunteering at local hospitals as well as helping where they could from their homes with the use of first aid kits distributed by Caritas after the fighting in 2012. Despite calls by Hamas not to leave their homes, thousands of people in 14 targeted quarters heeded Israeli warnings and evacuated and were being sheltered in U.N. school buildings. Some Palestinians remained in their homes, fearing theft in tough economic times. Auxiliary Bishop William Shomali of Jerusalem said the school at Holy Family Parish in Gaza had been opened to those fleeing their homes. Bishop Shomali urged Palestinian and Israeli political leaders to accept Pope Francis’ call for an immediate cease-fire. In Jerusalem, Matthew McGarry, country representative for Catholic Relief Services, told CNS he was in regular contact with staff in Gaza. He said they told him that although militants had been launching missiles in Israel from civilian areas, many people have also been killed by Israeli airstrikes in areas where there are no launch sites. A young CRS intern and her family were killed while sitting in their house, he said. He said CRS was working to procure nonfood items for Gazan residents for a time when staffers could distribute them. 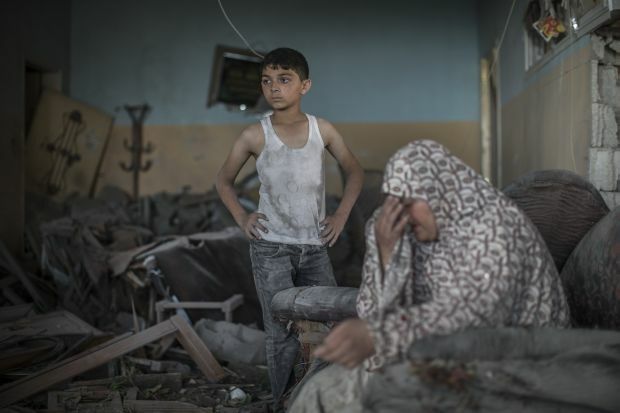 Dr. Issa Tarazi, executive director of Near East Council of Churches Department of Services to Palestinian Refugees in Gaza, told Catholic News Service July 18: “There is shooting everywhere, bomb strikes and airstrikes. There are explosions all around. Nobody can move. “Gaza is so crowded; everywhere you shoot, there are people. We have experience with this, and we don’t want it to be repeated,” he said. In a post on the Spanish website of the Institute of the Incarnate Word, Father Jorge Hernandez, parish priest in Gaza, said he had shared the translated message of support from Pope Francis with this parish and other Christians. “Dear brother, I am with you and the sisters and the entire Catholic community. I accompany you with my prayers and closeness. May Jesus bless you and the Virgin Mary protect you,” Pope Francis wrote in Spanish to his fellow Argentine priest.